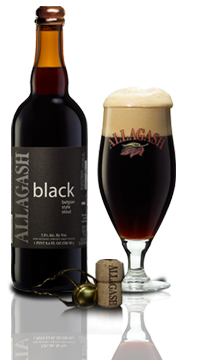 Allagash Black (7.5%): Allagash is a brewery founded in Portland, Maine in 1995 during the microbrewery boom. They focuse in European style beers from the beginning and this expression is also not an exception. It is labeled as "Belgian Style Stout" but basically a strong dark ale. Allagash Black is brewed from a mash of unmalted barley, wheat, oat and roasted malted barley. Caramelized sugar is also added during the brewing process. I had the chance to taste it from the tab but it is also available in 750ml bottles throughout the year. Look: Poured in a tulip shaped glass with stem. Opaque black, no light is going through whatsoever. Almost solid, firm and tan head which disappears very slowly. Nose: Sour European yeast, red wine vinegar, soy sauce and grape molasses. It has a dusty and chalky aroma like powdered latex gloves. Dark roasted espresso beans and very high cocoa percentage bitter chocolate. Taste: Creamy and velvety but not so thick mouthfeel. Grape molasses is still the dominant taste but I am also getting rotten red fruits and ripe damson plum. And roasted crunchy cocoa nibs... It has a very dry finish with interesting ash notes. Overall: Great brew to pair with meat pies, sharp cheese varieties like Stilton and smoked sausages but it's also very enjoyable sipping by its own. Don't ruin it if you don't have time to sit down and take your time. It's definitely not a beer to rush. I also liked it being served in a small glass. Pint glass wouldn't suit its nature very well.